Deciding who to invite to your wedding is one of the hardest parts of planning, and it’s definitely something that I hear my clients struggling with a lot. 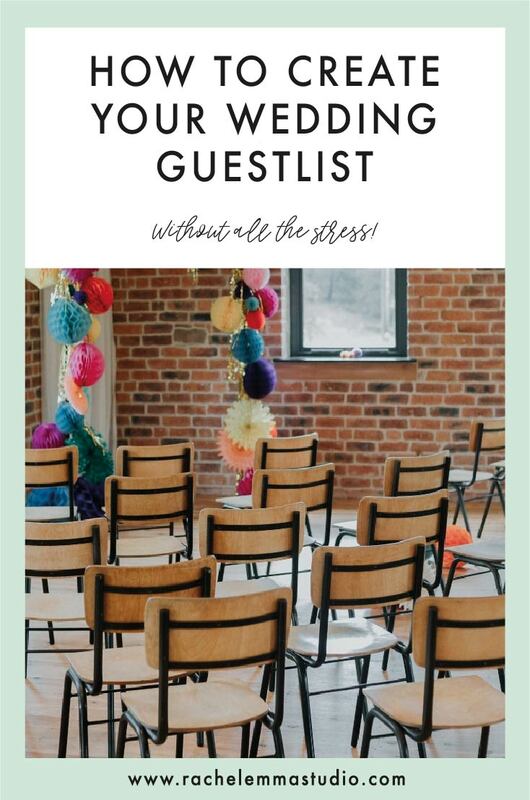 There are so many things to think about when writing your guest list, like your budget, venue capacity and often family politics (the trickiest one right?!). Luckily I’m here to help you out. In this next part of the Wedding Planning 101 series, I’ll be sharing my top tips for planning and managing your guest list so that you can keep everyone organised right up until the big day. If you haven’t read the post about setting your wedding priorities yet, I would definitely encourage you to do that first, because that will definitely help you with your guest list writing. Once you’ve done that, watch the video below or read the highlights to start your wedding guest list in the most organised way possible. Being clear on your own personal wedding priorities will help you answer the question of who to invite to your wedding, but [SPOILER ALERT] I would say the short answer is: whoever you want. What style of wedding are you hoping to have? What’s your budget? This post will help you get to that figure. Where is your wedding? Is it somewhere that’s easy to get to for most of your potential guests? One of the most awkward things about planning a wedding is feeling obligated to invite certain people that you wouldn’t necessarily choose to invite. This can be a really frustrating situation to be in, and the way that I always suggest dealing with it is to choose the path of least resistance. Which scenario is going to cause you the least stress? Are you the type of person that will feel angry on your wedding day if you’ve felt forced to invite a certain person? Will the person in question cause you stress by being there on the day? In this case, don’t invite them. Or on the flip-side, will you feel guilty on the day if this person isn’t there? Are they important to someone in your family - especially if that family member happens to be contributing to the wedding? Would it just be easier to invite them because it causes less family arguments and awkwardness? Sometimes it’s worth stretching your guest list a little bit to avoid causing you unnecessary agro. Whichever way you decide to go, remember that everything to do with your wedding is always your decision first and foremost, and you should do what’s right for you. Their addresses - important for sending out your save the dates and invitations, and will save you time hunting these down twice. Gifts received - this is super helpful for when you open all of your wedding presents, you can note down what each person gifted you so you can personalise your thank you notes - GAME CHANGER. Any other notes…. This can be where you note down any specific roles people are playing in the wedding, eg. bridal party, readings, musicians…. The final thing to say about your guest list, is just try not to feel too much pressure around the process. As long as you always communicate with people in the most honest and kind way possible, then you should get through it with minimal drama. I hope this was helpful, and don’t forget to download your free guest database below to help you with your people planning.